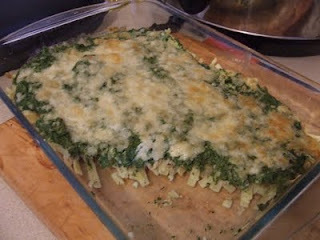 This is sort of like a tuna florentine... Really easy to make. The original recipe has microwave directions. Since I don't own a microwave, I simply did it stove top and bake bake in the oven. Came out really nice too. Place opened spinach package in a shallow microwavable bowl. Cook uncovered on high for 4 to 6 minutes or until thawed, turning every 2 minutes. Let stand for 2 minutes. Drain well and squeeze out excess moisture. In a blender or food processor, combine spinach, ricotta, mayo, egg and seasonings. Cover and process until smooth. In a 9x9x2 inch microwavable casserole dish, spread the cooked noodles. Top with tuna, then spread cheese mixture over tuna. Cover loosely; microwave in high for 8 to 11 minutes or until mixture is hot in the center. Sprinkle mozzarella over the top. Let stand , covered for 5 minutes or until cheese is melted. Makes 4 servings.